At Stubborn Mule Travel we specialise in creating tailor-made holidays for families seeking unique and rewarding travel experiences in Asia, South and Central America, Africa and the Arabian Peninsula. Using our knowledge and experience of travelling with our own children, we put together exciting itineraries that are exactly matched to the ages and interests of your family. Young children will need a slower pace, plenty of cool-drink stops and the chance to let off steam in a swimming pool or exploring a ramshackle temple. Older children will want adventure and activity and will love exploring sites by bike or soaring through the jungle canopy on zip-wires. Whatever the age or interests of your children, we will suggest an itinerary that fits so that you all get the most out of your holiday time. Families come in all shapes and sizes – even some without children – and we approach each and every holiday enquiry with the same commitment to understanding your individual needs and providing exactly the right holiday for you. Our basic philosophy is that exciting travel does not have to stop when you have children, but that you do need to ensure that your itinerary is designed with children in mind. At its most simple, we believe that if the children are happy, the adults will be happy too. Stubborn Mule was first conceived of in the mountains of Northern Laos… the views were just gorgeous, our road descending in long looping bends down to the valley floor, the jungle tumbling down the hills all around us. My daughter was roaring with laughter on the back of my bike, shrieking ‘Hold onnnnnnnnnn’ as we gathered speed, the wind whistling through our helmets on the long descent down the mountain. Exhilarated we reached the bottom and collapsed in a heap in a small bamboo shelter on the side of the road, next to Daddy and brother who this time (and this time only!) had beaten us. ‘That was amazing!’ panted Sam. ‘Let’s do it again’ gushed Meg. Mike (Daddy) and I looked at each other. This was what it was all about, the family, travelling, fun and adventure. My mind began whirring. Surely other people would enjoy this too? Surely this was the kind of family holiday that our friends would like? Stubborn Mule Travel, the idea, was born. Fast-forward several months, noses to the grindstone, and Stubborn Mule Travel became a reality with me, Liddy Pleasants as MD. I’ve been in the travel industry for nearly 20 years and have contacts all over the world having led and operated tours in most countries in Asia, Africa and the Middle East, as well as much of Latin America. Together with a colleague who has a similar travel industry background we pored over maps and slowly we began to pull together a range of really exciting trips that, crucially, are completely 100% family-friendly. We’ve travelled with our own children and I have also led lots of family group tours with other people’s families. We know the pitfalls and we know the joys. We know first hand that children will wilt when visiting the Grand Palace in Bangkok but will perk up with the excellent ice-cream shop at the end. We know that younger children will love Machu Picchu all the more if they are given time to explore and play hide and seek amongst the ruins. We know that all children will love riding camels out into the sand dunes of Oman and won’t want to return to a hotel for the night but would prefer to spend the night in a Bedouin tent, even if there aren’t hot showers. We know all of this because we’ve done it ourselves. 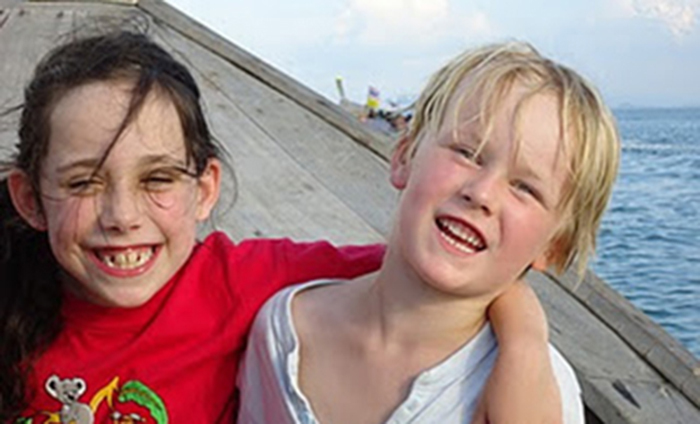 Our mission is to enable you to visit wonderful and exciting places with your children. Lots of companies can arrange good holidays but very few specialise in putting together holidays-of-a-lifetime for families with children. We do. We have travelled the length and breadth of our destinations looking for activities that your children will love, many of which you could never find in a guidebook or arrange by yourself. Planning a holiday is something that many parents like to do together. We are happy to discuss your holiday in the evening or at the weekend when both parents are home. Before you travel we will give you our 24-hour UK emergency number and the local emergency number for your destination. This gives you peace of mind so that you know you have someone to call if the need arises. As we have travelled with children ourselves, we can give you advice on everything that you might need to think about. If you are worried about getting malaria tablets into a toddler we will advise you to take a tub of Nutella and hide the tablet in a spoonful every morning. If you want to humour older children who cannot be away from their phone for long, we have an encyclopaedic knowledge of which hotels and lodges have reliable wifi and, more to the point, which don’t. If you are baffled by the GP surgery giving you a choice of whether to have some of the more unusual vaccinations, we can’t give you formal medical advice but we can tell you what we have done in the same situation. Nothing comes straight out of the box with Stubborn Mule. We know that every family is different and before we start designing a trip for you we make sure we understand what activities you all enjoy, the type of accommodation that works for you, your budget and so on. Our website example itineraries are intended to show you holidays that other customers have loved and are just a starting point. We can then produce an initial itinerary outline for you. You’ll want to check this over carefully to make sure that you are happy and we can revise anything that isn’t quite right. If it is more expensive than you had anticipated, we can make suggestions to reduce the price. If it cheaper than you had anticipated you may want to upgrade to a snazzy hotel for your last night or include a surprise hot air balloon ride for the children. Or perhaps you might want less activities included or more time on the beach…. just let us know and we will revise the itinerary accordingly. You can make as many tweaks and revisions as you need in order to ensure that we get it just right and we won’t let you sign on the dotted line until you are 100% happy with your proposed itinerary. Once you are, we will take a 30% deposit to confirm your trip and will then collect the balance two months before departure and will send you your detailed trip notes. These contain your final itinerary as well as lots of helpful advice on tipping, what to take, books to read and so on. In each of our destinations we work closely together with a partner company who are responsible for much of the day-to-day running of your tour. We will be responsible for designing your itinerary and picking your hotels but they will actually make the hotel reservations, arrange the correct sized transport, book (our hand-picked) guides and so on. Most are locally owned and all are locally run, with an office in the destination. This means that in the unlikely event of a problem you have people on the ground to provide complementary assistance to that provided 24 hours in the UK. Responsible Travel is a cornerstone of our operation. We don’t want to preach but we do want you to be confident that your holiday is being run in a responsible manner. What this means in practice may vary from one destination to another depending on local conditions but a common theme is that wherever possible we try to use locally-owned services (hotels, guides, restaurants etc) to ensure that as much money as possible stays in the destination. We also deliberately seek out local partners who share our philosophy and our desire to practice low environmental and social impact tourism. This not only means that our travellers are able to undertake their holiday in a responsible manner but also inevitably means a warm welcome from local people whose traditions and environment are being respected. We are strong believers in the fact that tourism can and should be a win-win situation for both travellers and locals alike. If you would like more details please have a look at our Responsible Travel Policy or call us. We are members of the Travel Trust Association, a trade association of Travel Agents, Tour Operators and Travel Organisers that operate trust accounts in order to provide financial protection for the consumer. To put it briefly, all monies paid to us by you are deposited into a trust account, which is supervised by an independent trustee. The funds are only released to Stubborn Mule after you have completed your holiday therefore providing you with 100% financial protection. See the Travel Trust Association website for further details or to verify our membership. Our membership number is Q0176. We also have ATOL certification, number T7608 which means that the flights and flight-inclusive holidays on this website are financially protected by the ATOL scheme. You can find out about how ATOL protection works on the Civil Aviation Authority website. We are parents ourselves and can give you the very best advice on travelling with your family.